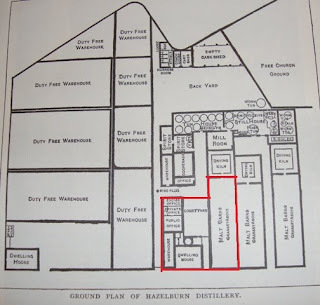 Hazelburn Distillery had the largest production volume and the largest footprint in that overcrowded distillery town when Barnard visited. It is also the Campbeltown distillery he writes most about and he includes two invaluable etchings, one of the buildings and one inside the still house, plus line drawings of the layout of the grounds and of the unique still apparatus used. The distillery was said to have a “commanding appearance from Longrow” although it was sited on Millknowe Road to the north of Longrow. 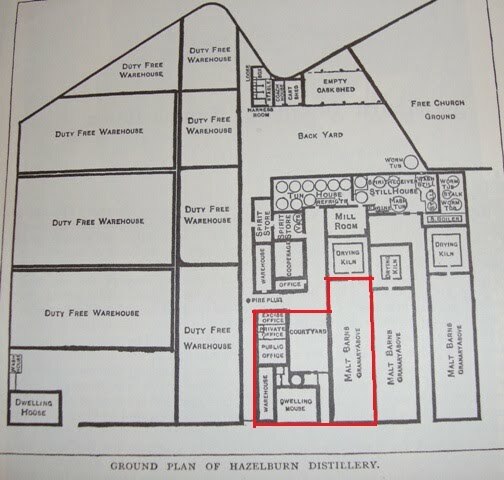 The original Hazelburn distillery was actually on Longrow but was later moved to Millknowe as it expanded and Barnard notes the distillery having been 'rebuilt' in 1836. The etching copied here from Barnard shows the scale of this distillery and the line drawing details the layout of the various buildings. The covered archway where the horse and cart is shown leaving the courtyard was the only entrance to the complex and is still part of the buildings that remain today. The section outlined in red on the line drawing shows the only buildings that remain. When Barnard visited, the haymakers were busy on the pastures on Gallow Hill which the distillery faces, although the barley used at Hazelburn was mainly supplied from Moray and Perthshire and was brought in by steamer. Barnard was helped in his visit by one of the owners, Mr Greenlees. I am not going into detail about the various ownerships of the Campbeltown distilleries as this is well covered elsewhere by Stirk, Udo and Townsend, save to say that two of the common distilling names for Campbeltown, Greenlees and Colvill, were both involved with Hazelburn. Along with Mitchell and MacCallum these four family names are synonymous with distilling in the town, and to trace all the changes in distillery ownerships would require a separate essay in itself. The descriptions in Barnard of the malting and mashing processes carry no surprises but the distilling apparatus is worth looking at more closely. The wash still at 7,000 gallons is reported as the largest in Campbeltown, although Barnard later describes the Wash still at Ardlussa Distillery as 18,000 gallons, although this may be a misprint. The heating for all three stills is by furnace and they are surrounded by brick-work so that “the flues carry the heat all round”, the etching here showing the design. I am later to see that this practice still operates on the wash still at Springbank. Townsend (1993) describes these as Lomond-type condensers, although the Hazelburn condensers used columns rather than the horizontal plates found in Lomond Stills. Worm tubs were also employed at Hazelburn to complete the condensing process so the unique design of the heads appears to just be a way of controlling the purity of the spirit produced. The spirit was also triple distilled, as is the Hazelburn branded spirit produced by Springbank Distillery today. Barnard mentions that the spirit safe is located in the 'Ball Room' and I recall this phrase from Yoker distillery where the Ballman’s chair is also described. Does anyone know the origins of the term Ballman or Ball Room and why this was used in some distilleries? The main part of the complex was taken up by the bonded warehouses, 9 in total, and holding 302,000 gallons (1.4m l) when Barnard visited but capable of storing up to 500,000 gallons (2.3m l). However, beyond this extensive warehousing, the principal storage for a further 15,000 casks was in Glasgow. Barnard notes that he visited these stores on a return to Glasgow but I have not yet found details of when this return took place. David Stirk, in The Distilleries of Campbeltown (2005), notes that when Mackie & Co (as White Horse whisky) acquired the distillery in 1920 they did so with a view to using the extensive warehouses for their own storage, transferring over 124,000 gallons (563,000 l) from Craigellachie in Speyside in 1922. It appears they had no interest in running the distillery as well and it closed in 1925. White Horse Distillers were taken over by DCL in 1927 who continued to use the warehouses until 1988 and they were eventually torn down in 1995. The buildings were bought by the Hazelburn Trust in 1991 for the princely sum of £1 with a view to transforming them into Hazelburn Enterprise Park. This venture was never fully realised but the buildings that remain are now home to Campbeltown Learning Centre (part of Argyll College) and other offices. I decided to enquire inside to see if anyone knew about the history of the distillery and I soon have an appointment with the building Manager, Clive Good. Clive provided a wealth of information about the development of the site in the 1990s and beyond and he kindly pointed out some of the interesting elements of the old buildings. The photograph here shows the front of the premises as they are today which can be compared with the etching from Barnard above. It can immediately be seen that the granaries and malt barns have been extended as the distillery grew, from two levels in 1885 up to four by a later unknown date, and the outline of windows from the other two of the three malt barns can be seen on the low wall remaining. Much of the brickwork in the old buildings had deteriorated and contributed to the extensive demolition that was required in the 1990s, but the cast iron support columns and wooden beams within the remaining buildings are the original installations from 1836. Clive advises that the beams were then second hand and were likely first used in another building earlier in the 19th century. The additional floors were added to the buildings by stacking more cast iron supports onto the ones below. Campbeltown was not just famous for its whisky but was also a major port specialising in herring and ship building. The techniques of ship building were also of use to distilleries and the length of malting floors and warehouses was made possible through some of these techniques, including the use of spliced joints in some of the beams to extend the roof support structure. The original covered archway through which Barnard entered the premises is still there although closed by fire doors to provide a corridor between two buildings. Sadly the distillery name has long gone from above the arch. In the grounds outside there are still cobbled tracks where the Still and Tun Houses once stood. The outline of some of the warehouses can still be seen on the northernmost wall and where the warehouses once stood is now the new Campbeltown Police Station, opened last year, and parking. The old Manager’s house and the various distillery offices on the north side of the malt barns are still used as offices. To the rear of these buildings is the old Excise Office which still has the original fireplace, filing cupboards and safes in place. The filing cupboards still have shelf labels to mark where various slips and records would be kept, and faded notices still cling to the doors where they were pasted many decades ago. Of all the lost Campbeltown distilleries Hazelburn perhaps provides the most evidence of the old venture. Re-use of some of the buildings and the continuity of the name both last as reminders of the largest Campbeltown Malt production in Barnard’s time. My thanks to Clive Good for his time and for his enthusiasm for the Hazelburn story, I think I detected a soft spot in his heart for the old place. We will return to this scene later to discuss the old Argyle distillery that stood right next door; the journey now moves on to Springbank.